The Washington Patriots and Cascade Christian Cougars faced each other for an exciting Sterling Shootout contest! Listen as Nic Beckman provides an audio recap of the game. 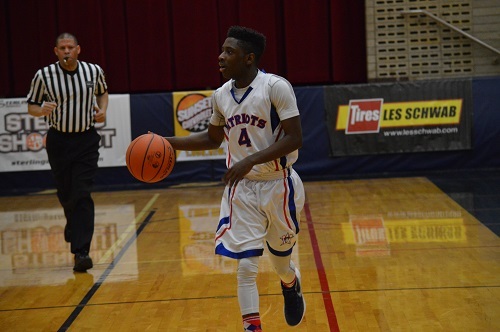 The fourth game in a big slate of Sterling Shootout tournament play featured the Patriots and Cougars of Washington High School and Cascade Christian. The excitement of the previous game that extended into triple overtime continued in this game as both teams traded buckets throughout the first half of play. Tyler Fox, Jesse Howells, and Grayson Jones each scored eight points in the first two quarters, providing a balanced attack. Washington’s Alijah Maddox and Dante Willis contributed solid first half production and the score was knotted at 28 going into the break. When play resumed, the Cougars gradually were in the process of building a lead that would extend into the final frame. A pair of buckets from downtown by Fox and Dylan Cooley helped the Cougs grab a lead that grew to eight point heading into the final minutes of play. This is when Jaomani Scott and Kaleb Whitemarsh struck as the pair of guards combined for 15 fourth quarter points which was enough to pass CC in the final seconds. A full court desperation heave by Cascade Christian hit the rim which would have sent the game to overtime, but no such luck for the Cougars. Week 4 of the high school gridiron season included an intriguing non-league game between the defending 1A champions Cascade Christian and rising Seamount squad Lindbergh. The setting was Renton Memorial Stadium featuring the airport in the backdrop where undefeated LHS played host. The game broke out with a slow start as each team struggled to move the ball fluidly. The first big play of the game was an interception by Eagle cornerback Steve Celis. The home team would eventually capitalize on the momentum of the pick when Anthony Walker took a sweep 58 yards to the house. It wasn’t until the second quarter when the visiting Cougars woke up. Senior tailback/defensive back combo Zach Bartolome rumbled up the gut for a 20 yard touchdown run to tie it up. Later, he forced a fumble and turned it into a 48-yard score and the lead ten seconds later. Needing a response to swing the momentum in their favor, Lindbergh capped off a long drive with a 6 yard scamper to the goal line by DeMarco Sauls. Before the half, Evan Patrick grabbed the lead at 21-14 when he took a 3 yard run to the end zone. When the teams took the field for the second half, the rain started to fall onto the turf and the pace quieted down. Cascade Christian used extended possession to wind down the clock and continue to build their lead. Madden Tobeck put the Cougs up two possessions on a 1 yard goal line push. The inability of Lindbergh to establish an aerial attack allowed the CCHS defense to load up in the box and pressure Samuel Nehren. Lindbergh made a late charge with a fourth quarter score, but eventually allowed Cascade Christian to put a stamp on the contest with their fifth touchdown of the game. Both teams will carry a 3-1 record heading into next week. 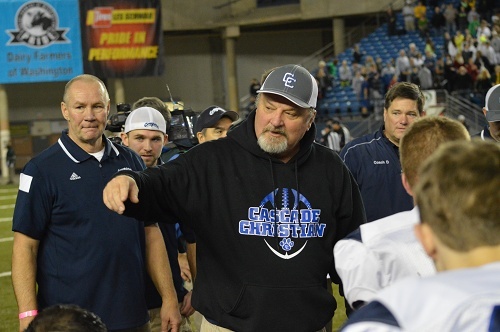 Since 2008, Cascade Christian head coach Randy Davis has led the Cougars to the 1A state championship game five time including winning the title in 2010. The senior class remembers how their season ended in the semifinals last year and showed determination to bring the hardware home in 2014. Coach Davis understands the Colville Indians present a challenge in the Gridiron Classic, but he explains how his team is prepared to finish the season 13-0. The Cougars have a strong core group with a winning attitude capable of taking the championship trophy to the Puyallup Valley once again! 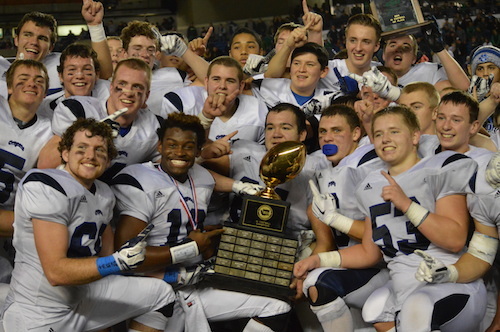 To catch the complete radio interview with Cascade Christian Coach Randy Davis, simply click on the PLAY BUTTON below. Day two of the 2014 Gridiron Classic started with the 1A title game which was a classic East vs West showdown of Cascade Christian from Puyallup and the Colville Indians. Each team entered the contest with a blemish-free 12-0 record. This game marked Colville’s first appearance in the championship game whereas Randy Davis had led his team to 4 of the previous 6. The senior class had knocked on the door of a state title for years and according to Coach Davis, the upperclassmen demonstrated a high level of commitment to vie for the hardware one final time. Colville’s dream season was 48 minutes away from the perfect ending, but could they complete the job? The Cougars started the game as they have many times before by leading a long touchdown drive that eats up nearly an entire quarter of game clock. The 16 play, 81 yard march was capped off by a 5 yard run by Riley Ramos. Colville responded by leading a scoring drive of their own which ended on a Colton Vining run. The pendulum would swing back and forth several more times. The Cougs regained the lead midway through the second frame when Ramos found the endzone again. This score was made possible by a Russell Wilson-like escape by Jaelin Goldsmith who was in the middle of a collapsing pocket but kept the play alive and found an opening receiver for a big gain. At the break, Cascade Christian held a 13-8 lead. Colville would receive the ball to start the second half and wasted no time getting back to business. Less than three minutes into the third, the Indians were back on top as Vining recorded his second of four touchdowns of the day. The Cougars started to look sluggish and lost some of the edge they carried in the first half. Colville was able to stop CCHS on a fourth down attempt in the Indians’ red zone but were stopped. Moments later, Ben Knight connected with Journy Young for 50 yards to set up Vining’s third TD. Colville held a 7 point lead with 11 minutes remaining. That changed quickly when Goldsmith tied it back up on a 59 yard keeper to the house. 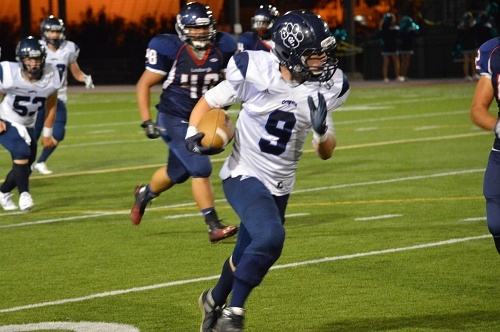 In the final minutes, Cascade Christian was moving the ball well to potentially set up the winning score, but Tyler Ward intercepted Goldsmith. We headed to overtime! The Cougars received the ball first and proceeded to move the ball 25 yards in 6 plays ending with a Robert Terhune run from one yard out. It took Colville seven plays to punch the ball in by who else but Colton Vining. Instead of kicking the extra point and forcing a second overtime, Coach Cornwell decided to put the fate of the title into one play. The decision came up half a yard short as the Cascade Christian defense stuffed the run and in doing so, won the game. An exciting game from start to finish with tremendous fan support for both teams. 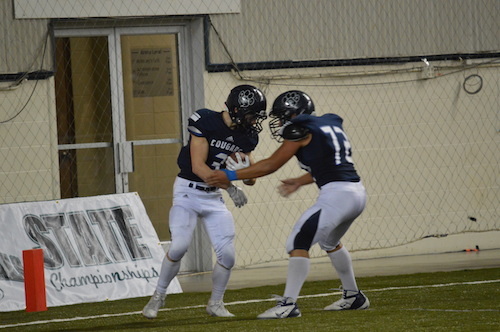 The FinalScore – Cascade Christian 27, Colville 26. One year ago, the Cougs that hail from the Puyallup Valley ended their season in the Tacoma Dome. Unfortunately for them, it was on a game winning overtime field goal by Mount Baker. This year, Randy Davis’ Cougars refused to let history repeat itself. They advanced in the playoffs to earn themselves a chance to compete for the title next week with a win over the Eatonville Cruisers. Both teams had identical 11-0 marks heading into the contest. How would one team emerge to maintain the spotless record? CCHS wasted no time getting their dynamic offense rolling. Jaelin Goldsmith connected with Bryce Powers on a 59 yard bomb with less than two minutes elapsed in the game. Their ability to throw the ball effectively opened up the run game and turned into a rushing score by Riley Ramos. The Cougar defense led by hard-hitting Mason Tobeck contained a run-heavy Cruiser squad and pitched a shutout in the first half. One more score by Cascade Christian in the first half by Tobeck brought the lead to 21 points heading into the locker room. But before halftime, Eatonville freshman Tucker Poil pulled off a rare feat. He intercepted a pass, but was stripped of ball as he tried to return it and turned it back over. On the very next play, he recorded another interception! Eatonville needed to make changes at the intermission to climb back into the offense and the momentum slowly started to shift in Coach Fairhart’s team’s way. A seven-play, sixty-one yard drive was capped off with a 3 yard touchdown grab by Justin Brandt from Jacob McCormick. Eatonville was able to quickly get the ball back and drive into Cascade territory. A big gamble on fourth down deep in Cougar territory fell short for the Cruisers. Moments later, sophomore tailback Zach Bartolome took the rock 58 yards to retain a comfortable lead. Goldsmith found Powers in the endzone twice more from 14 and 15 yards out to complete the Coug scoring. In the final seconds, Eatonville’s George Tomal scored a touchdown to get his team into double digits. Cascade Christian takes on Colville next weekend at the TDome. The FinalScore – Cascade Christian 42, Eatonville 14. The Sterling Athletics Christmas Classic started with an interesting matchup between a large public school and a small Christian school. Coach Kellen Hall’s Enumclaw squad entered this contest with a significant size advantage in addition to experience as the Hornets six seniors outnumber Cascade Christian’s one. However, the Cougars from the Puyallup Valley led by Jerry Williams were prepared to go toe-to-toe with their SPSL opponent. Enumclaw established their dominance quickly as the opening tip resulted in an outlet pass and a score in mere seconds. Hornet forward Zac Webb outscored the entire Cougar roster in the first quarter as he notched 10 of his 20 points in the opening frame. The Cougs seemed to take a collective deep breath going into the second quarter because the tides began to change. Jordan Tveter continued to have the hot hand as three more jumpers fell for the junior. The vastly undersized CCHS squad surprisingly started to win the rebounding battle. After an identical second quarter output, the Hornets led 26-19 at the break. Cascade Christian returned to the floor with the “bend-don’t-break” mentality which kept Enumclaw within reach. The Cougars accepted the underdog role with open arms by out-hustling the Hornets and forcing them to cough up the ball. EHS countered with aggressive play, but translated to numerous player-control fouls. Despite Enumclaw’s scoring woes, they held an eight point lead into the fourth quarter. CCHS started to shoot threes; this is when the hoop grew to the size of a swimming pool for the Cougars. After the first two dropped, people entered the Kennedy gym as if by magnetic force because Enumclaw’s lead was shrinking. Another pair of threes fell through and the Cascade Christian sideline erupted as they trailed by a single point. This is when Enumclaw seniors Drake Rademacher and Bryce Peterson said enough is enough. 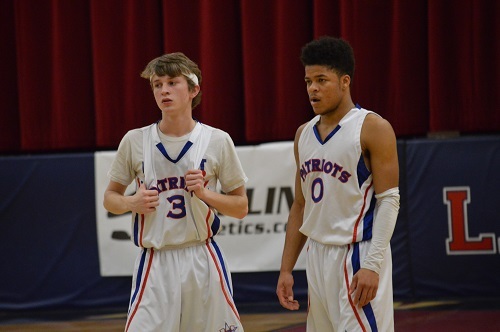 The Hornet duo demanded the ball and forced their way to the bucket and drew fouls. The Hornets were able to weather the storm and escape with a 52-44 win. The first Saturday game in the Tacoma Dome hosted the one loss Mount Baker Mountaineers against the undefeated Cascade Christian Cougars for a trip to the 1A state finals on December 7th. The first half saw back and forth action, with Mount Baker capitalizing on two fumbles by the Cougars and turning those into 14 points. Mount Baker looked to be the more aggressive and energetic side early on, but Cascade Christian stuck to their game plan and continued to execute on deep passing plays to keep the game within a touchdown after the first half. Mount Baker led 21-14 at halftime on the back of two rushing touchdowns from Izaiha Shwinde. Defense was seemingly the focal point for both coaches at half because the defenses on both sides heated up in the third quarter. No score from either team allowed Mount Baker to hold their seven point lead going into the fourth. The Mountaineers struck early in the fourth quarter on another Shwinde run, his third of the contest, to take a comfortable 28-14 lead with just under 11:30 to play in the contest. But Cascade Christian wasn’t done yet; on their heels and needing a score, quarterback Jaelin Goldsmith rushed five yards up the middle for his second rushing touchdown on the day, putting his team within one score of the Mountaineers. The Cougar defense held strong and forced a punt from Mount Baker, getting the ball back with 89 yards to go and just under six minutes to play. Cascade Christian put together a spectacular drive, marching all 89 yards and scoring on a Hunter Austin 5 yard run to tie the contest with 1:39 remaining, and ultimately sending the game to overtime. Cascade Christian got the ball first in the extra frame but could not crack the stingy Mount Baker defense who forced a turnover on downs. Mount Baker started their possession from the 25 yard line, needing any score to win the game. After a big 11 yard Andrew Zender rush on their first play, Mount Baker was in field goal range. After three downs that resulted in no gain, Alex Tyska stepped up for a 28 yard field goal and smashed it through the uprights for the win. Mount Baker will now play in the Washington state 1A final on Saturday, December 7th. Playoff football is exciting for every classification, and the crowds increase greatly from regular season play. For 1A schools like King’s, Saturday night’s game filled parking lots to capacity and nearby streets served as overflow. A meeting with the Puyallup powerhouse Cascade Christian put a trip to the semifinals on the line. The crowd on the home side of Woolsey Stadium were hoping they would be in the same seat next week in the semis, but the Cougs had other plans. After a scoreless first quarter, CCHS got onto the scoreboard on the first play of the second frame on a goal line blast by stocky senior Hunter Austin. 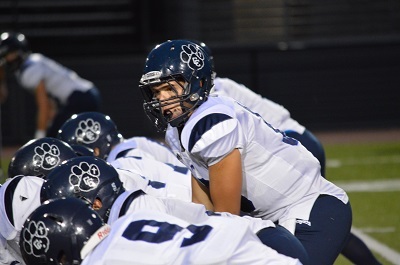 Hunter was one of many productive ball carriers out of the backfield by Cascade Christian as Riley Ramos ran the ball with regularity, one of which a 5 yard run for six points. With less than a minute remaining in the first half, King’s capitalized on a lengthy drive by pounding in a two yard run with Chris Yand. The Cougars led 14-7 at intermission. With only seven points of separation going into the second half, it appeared that game was up for grabs. However, the Cougs were able to deflate the home team by combining circus catches with defensive pressure leading to turnovers and putting Knight’s QB Koa Wilkins in a pressure cooker. A pair of 5 yard quarterback sneaks by Jaelin Goldsmith forced KHS to adjust their game plan to catch up. The Knight’s just didn’t have the firepower to respond to the Cougar assault. A tip drill catch by Mason Tobeck in the fourth sealed the victory for CCHS as they left with a convincing 37-13 win. They will host the semis and are one win away from a trip to the Tacoma Dome.